Today I want to let you guys know about a product called the Shed Defender. 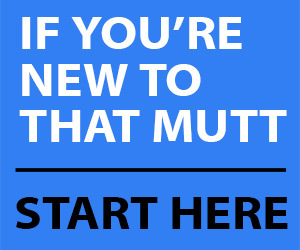 I’ve featured the product here on That Mutt a couple of times. It has a lot of uses and can help a variety of dogs and their owners. … But on a serious note, the product is more than just a silly, adorable outfit. This post is sponsored by Shed Defender. Use code Mutt15 for 15% off your order. Click here. Leave a comment at the end of the post for a chance to win a Shed Defender for your dog. In this post, I’ll share some examples of professionals who use the product for the dogs in their care. Dr. Pete Lands is the director of emergency and critical care at Saint Francis Veterinary Center in New Jersey. 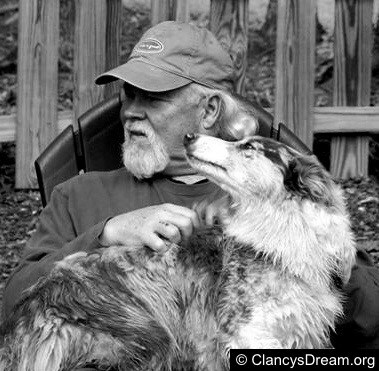 Kenny Shuck runs a rescue group for border collies based out of Indiana. On a daily basis, Dr. Pete Lands’ clients ask him how they can stop their dogs from shedding. While searching online, he came across the Shed Defender for managing shedding and decided to try it for his own dog, a Labrador. Lands said the product was easy to use because his dog will do anything for a treat! Turns out, a lot of dog owners want to find a way to control the shedding. I shared many examples in this post. The Shed Defender is available on its website in many different colors and sizes. Use code Mutt15 for 15% off. My Lab mix Ace sheds worse than any dog I’ve met, but I prefer to use the Shed Defender for a different reason – replacing the medical cone collar. Ace has had plenty of allergies over the years that cause hot spots and other skin problems. He’s spent plenty of time wearing the cone, and the Shed Defender is helpful because it gives us an alternative. Kenny Shuck runs the rescue group “Clancy’s Dream” and said he also finds the Shed Defender valuable as an alternative to a cone collar. The cone limits the dog from reaching the surgery spot, but it also limits the dog’s freedom, he said. For example, walking through doors with a cone collar is challenging for some dogs. So is going down steps. And while walking in the house, dogs can easily knock over or damage items. Shuck said he’s tried various styles of cone collars but they increase the heart rate of some dogs or spook the dogs and cause anxiety problems. Some dogs will even just lie still and not move when they have a cone collar on. Yet, while wearing the Shed Defender the dog has “total freedom and can live a normal life,” he said. The product has helped several of the dogs in his rescue group. One of the dogs recently had abdominal surgery and the Shed Defender keeps the area covered. 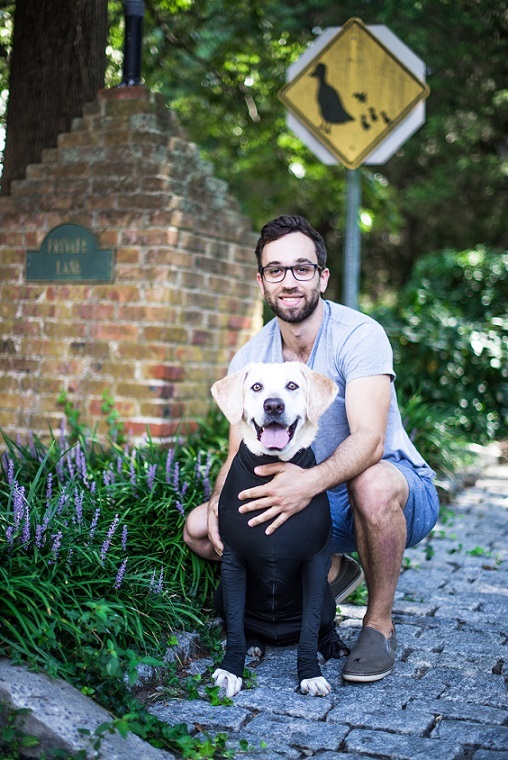 Another dog is wearing a Shed Defender to protect an ACL surgery. “It does not rub or interfere with any surgeries we’ve had,” Shuck said. He wrote a blog post about how the product has helped the dogs in his rescue. Read it here. Likewise, Lands said he also recommends the product for some of his post-operative surgical patients. Lands listed out several other examples where the product is helpful. 1. Warmth in the winter. 2. Keeping dog hair out of the car. Lands said his friends and family would complain when he picked them up in his car. They didn’t want to sit in all the dog hair! 3. Reducing a dog’s anxiety. Lands said the Shed Defender might decrease a dog’s general anxiety during thunderstorms or car rides. This is because it provides a source of constant skin pressure that can have a calming effect on the body. Both Lands and Shuck said most dogs don’t seem to mind wearing the Shed Defender. I also found this to be the case with my dog Ace. If needed, Lands suggested introducing the Shed Defender with something your dog loves like a treat or a favorite toy to help them relate to wearing it with a positive experience. 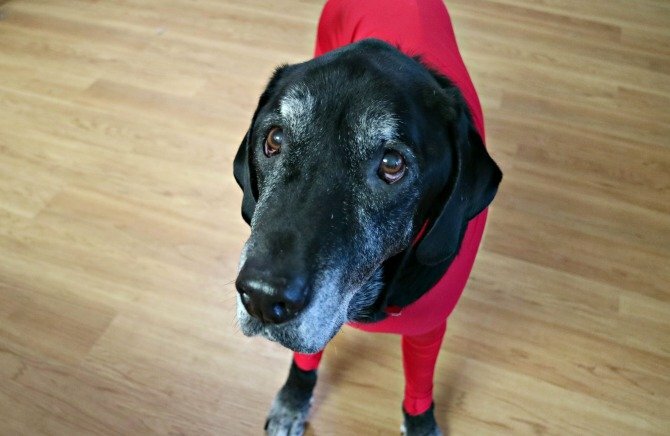 Shed Defender is giving away a onesie to one reader of That Mutt (must have a U.S. mailing address). Yes, I just called it a onesie. To enter, just leave a comment below so I know your dog wants in on the drawing. I’ll choose a winner at random on Tuesday March 22. The winner will be notified by email first and then posted here. Let me know in the comments if your dog is interested in a Shed Defender. That Mutt’s $5/mo or higher Patreon members receive automatic entries into all our giveaways, including this one. Join us on Patreon here and support the blog. Please share this post with anyone you know who might be interested. Read my full review of the Shed Defender here. 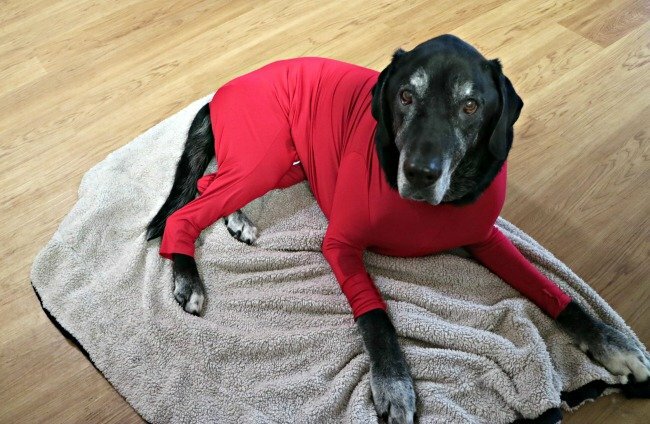 My Tootie has horrible allergies, is a big shedder and shakes out her skin during thunderstorms, this would be perfect! Aww, sorry to hear of her allergies and fear of storms. 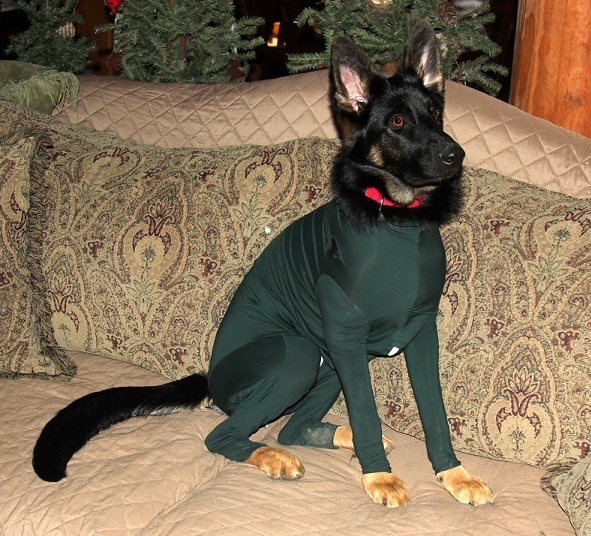 This would work great for my Shepard puppy! The cone of shame after his neuter is what I’m dreading the most. Sorry, I don’t agree with this. For after surgery I would agree except for stitches as the dog would overheat. Dogs aren’t meant to wear clothes, they are meant to shed. If someone can’t put up with a dog shedding and cleaning, then they should own a poodle. I have a GSD and Golden both are shedders, and it’s part of owning a dog, like picking up after them during a walk. IMO sorry if I offend. The coat is very breathable and in all the times I have used it for our rescue dogs, I have never had a problem or issue. The material is thin and very strong. My friends pup needs this so bad. We learned she has a food allergy and has weeks to go until we clean out her system from the bad foods. Sorry to hear your friend’s dog has allergies. My partner and I took in our Pup Raja a little over a year ago. She’s almost 12, and has very high anxiety due to abuse and moving round a lot in the past. Not only would the shed defender be great at helping to manage her shedding, but help with her anxiety as well! What a great idea!! Let us know how you like the product! I would love to win one of these for my german shepherds. One of them is colder in the winter time even with her fur and this would be perfect for her. 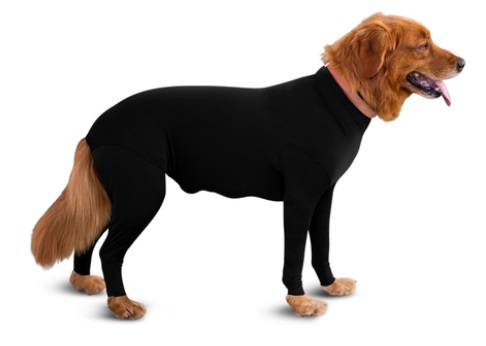 Plus it looks like it would hug like a thundershirt and she is anxious so I think it could help with that too. Sisko wants in! Poor little guy has allergies and has to wear the cone whenever he’s not being monitored or else he’ll just itch for days. I would love to win one of these for my Aussie. It might help him to not be so hyper and anxious about things. I would love to give it a try with him. I would love to be able to gift Lani with a shed defender. She sheds like crazy & has anxiety when being leaver her home during work. Haha wow, auto correct and bad grammar storm. I would love to win one of these for my Aussie/Border Collie mix, Goose. He has long fur that sheds year round, but it’s even WORSE with the change of seasons! I have to keep a handle on it to prevent allergies but there’s just so much! This would be helpful for Brody as he chews when he is nervous and has severe separation anxiety. This item would be very useful during thunderstorms as well. My dog (Dawg) has alergies and I have to vacuum every day to keep the hairs up. I have to empty the container twice. Thank you so much for your posts. I love getting them. My little Georgia is a perfect,sweet reservation rescue and we are going on a year long road trip. 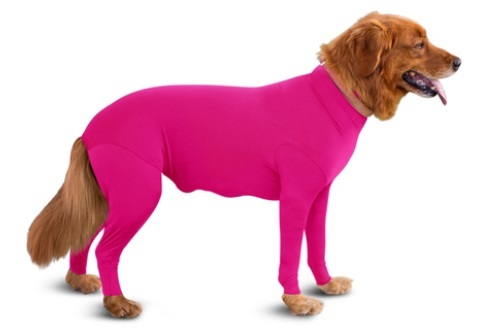 This onesie for doggies would be perfect to help keep my car free of dog fur and help keep her warm when we are in the Northern states! Hey, this might help with my bull terrier mix. She seems to scratch herself as an attention seeking behavior. We’ve noticed putting a dog shirt on her tends to decrease the scratching. That with the tightness could help her feel better. Thanks for all of the helpful posts! I would like to have one for my lab whi sheds like crazy and one for my Vizsla for added warmth 24/7 in the winter. Wow! I love the blog and would love to try this product! my dog suffers from anxiety , this would be greet for her . I have two pugs. I wish I would have had a shed defender after Louie’s patella subluxation surgery or after Max’s mast cell surgery. For them, the cone was impossible and the blow up cone didn’t work either. It would be good for Louie now as the metal plates and rods in his leg hurt him when they get cold in the winter. We would love to win one! OMG-I’m single so a great conversation starter! On a more serious note some of the practical applications i.e -allergies, anxiety, etc. it may be beneficial. Texas could so use this, I wouldn’t have to vacuum every day. Serious shedding due to allergies. His cousin Mango wears Onesies all the time to keep warm, he is a Chinese Crested. so glad i came across this article. have always thought there should be a better alternative to the cone collar. my dog had developed a severe cut on his throat because he had to wear the cone collar right after his surgery but he couldn’t reach his food in his bowl so would repeatedly bend down into his food bowl youngmeeand agitate his throat while doing so. Oh, I’m so sorry to hear your dog hurt himself with the cone. I would LOVE to have a shed defender! We have a dog who was dropped off down our dirt road in the middle of nowhere and he curled up outside our door. We looked everywhere to see who he belonged to but no one claimed him. We had him neutered/shots and he became our inside dog that is loved very much! Thank you for this opportunity!! My dog has. Asked to be in on the drawing. He could use this. My rescue dog, Oklee has allergies and anxiety. This would be a great to try!! I would love to try this on my dog, Handsome. His allergies have left him with very little hair on his legs and underbelly, so he gets cold. It’s sad to see an 88 pound dog shiver. I put coats on him but they don’t cover his legs like this does. I just started him on omega 3-6-9 select so I hope to see improvement soon. This shed defender onesie would surely help too. I would love one of these because I take Enzo in my car every day so this would help with the hair loss in my car. He also is weird about sitting on the cold leather so typically I have a hammock type thing in the back seat but he tore part of it one day so currently getting that fixed and the other day he was trying to dig at the seat because he didn’t want to lay on it. Enzo is a dalmatian so he sheds year around and sweeping on a daily basis has become my life. I’d love to give this a try for an anxious boy I know. My dog sheds so much. I have tried different diets, different brushes, etc. It’s not even summer and there’s fur everywhere.i would love to try this on her. I have a bichon so no shedding in my house. However, this looks like a great replacement for a cone if she needs surgery in the future or as an extra layer when it is cold in the winter. I never thought I would put clothes on a dog but she shivers so she has several coats for outside (short legs = mud) & a shirt to wear inside on the real cold days. I live by an Asian Wedding venue and several times over each weekend I can hear lots of fireworks which scare me. My mistress cuddled me but I still tremble. Maybe I would be happier if I could wear a That Mutts Shed Defender like a comfort blanket. I would like to try one. My pup Junior badly needs this. Her black fur gets EWEYWHERE! Wouldn’t it be cute if they made superhero themed ones? The tightness made me think of that haha! Boo Autocorrect! Her name is Junie! I have a puppy Tervuren and he sheds! There known to shed a lot! I’ve heard of these onesies for dogs! But I’ve never got around to trying it out. I like the idea of this even though my girls don’t really shed much, the shed defender is good for other things, liked if your dog has surgery, or has a licking problems, or has a skin problem, it is so much easier than using a cone collar and much easier on the dog. I would love to have one of these if my girls had to have surgery again. I think it might also help them when we have storms, we have tried several other things and they did not work so I would hope that something like this jumpsuit would work on them. 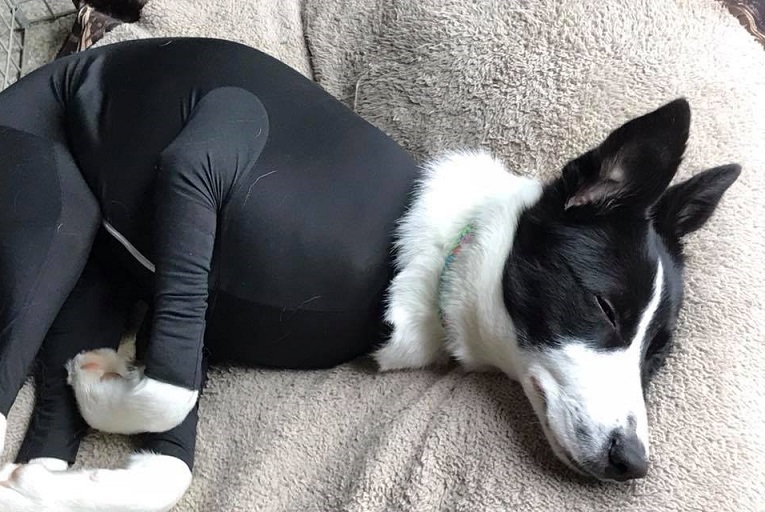 I would love to try one of these lightweight suits to see if it would work for my husband’s asthma, which has become worse the 10 months we have had out Border Collie!! We love her and she loves us! We are doing everything possible to cut down on shedding and dander issues, de shedding tools to brush her with de shedding shampoos, vacuuming and dusting tons! De cluttered! She is our sweetheart! I have read 40 reviews on the shed defender website and then found an artical from your site here and it really helped me realize it can help calm her craziness that happens to her when she gets anxious over something unfamiliar!! It would be great to win one of those suits if it did not make her too hot! Her hair is really long! I have been told she is long haired rough coat, but her coat feels silky in most areas! Good thing is our house always stays cool winter or summer because my husband is a hotbox and needs the temperature set pretty cool!! Katrina, the giveaway has ended but the suit shouldn’t make your dog too hot. It is very lightweight and breathable. I hope it helps! Thank you! I truly do believe it will! So many positive feedbacks! And we will not have her wear it when we are hanging outdoors around the gardens and lake, because it is full sun, and can be very hot!